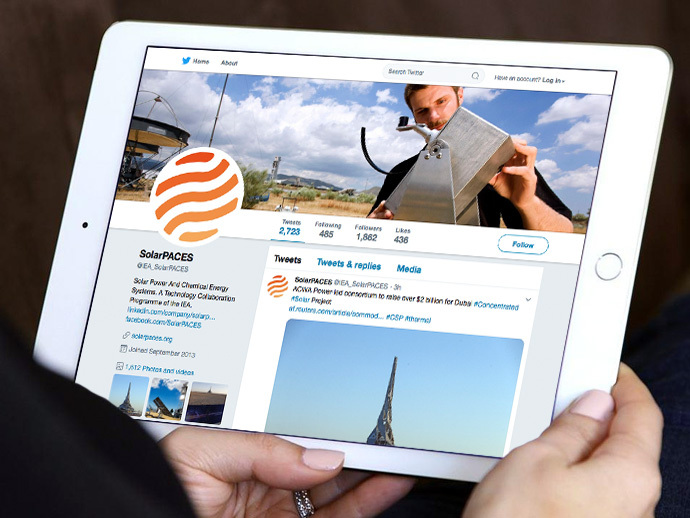 SolarPACES is an international cooperative network bringing together teams of national experts from around the world to focus on the development and marketing of Concentrating Solar Power systems. SolarPACES was founded in 1977. Task. To replace the old, outdated logo with a new one to represent what solar thermal energy has to offer in today’s world. Misleading logo massage: that SolarPACES is another PV installer. With the exponential growth in rooftop PV installations over the last 10 years there is an abundance of sun/PV panel logos. SolarPACES new logo has been designed to differentiate the thermal aspect of solar thermal energy from solar Photovoltaic. The color of the icon going from lighter orange to darker and redder suggests the increasing heat as the solar thermal process is underway, and the waving lines suggest energy pushing out. When shown on blue backgrounds, the deepening colors suggest the darkening evening sky, representing the dispatchability of solar after dark with thermal energy storage. The round shape suggests not just a sun (a common motif in solar logos) but also the round shape of the cylindrical storage tanks that enable solar thermal energy to be stored for dispatch at any time needed, even after dark.